Spaghetti Dinner – Saturday November 17th! 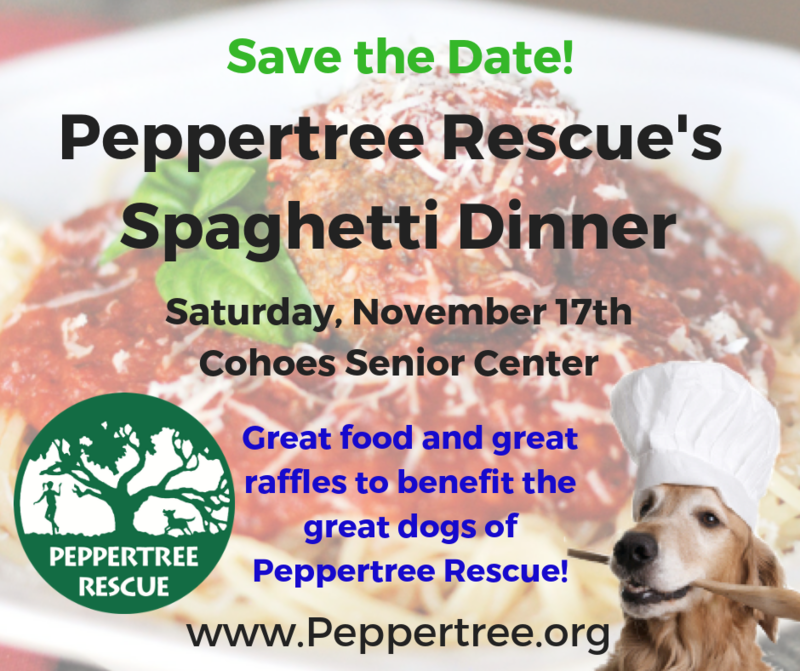 It is time for our annual Spaghetti Dinner benefiting the dogs of Peppertree Rescue! Our Annual Spaghetti Dinner! Featuring delicious entrees with homemade meatballs using local grass-fed beef from Kinderhook Farms, sausage, pesto as a vegetarian option, and served with a salad, beverage and bread from Perreca’s for just $12, smaller children portions are available for $5! There will also be delicious homemade desserts available for a small donation, and complimentary coffee and tea.Not only will there be amazing food, there will be raffles, silent auctions and a 50/50 raffle, as well as Peppertree Merchandise available! Everyone is welcome to this event as long as they enjoy great food and great company to benefit great dogs. Thank you to Kinderhook Farm for their wonderful discount on local meat, and Perreca’s for donating their bread! If you would like to help us cover the expenses of our dinner, please consider becoming a sponsor! If you are interested in hearing more, or would like to sponsor a table, or have your dog on our “Peppetree Tree” then please call Alissa at 518-598-6797 or e-mail her at peppertreealissa@yahoo.com. Pictures can be e-mailed or mailed per your preference. Pictures will need to arrive by November 10th to be displayed. Thank you for your consideration and support. Without events like this, and the support of our local community we would not be able to do the work we do.